I’m very sad that I did not get these in time for Christmas since that is their main focus. However, there are plenty of images that fit the general winter theme and a few patterns that can be used year-round. 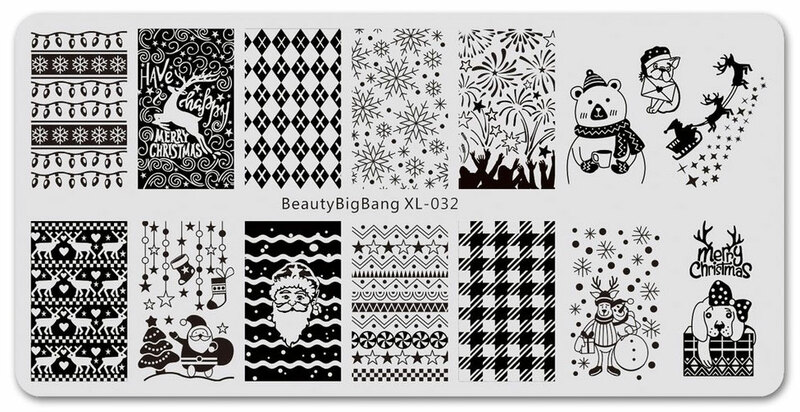 Since this is my first Beauty BigBang stamping plate review in a while, I’ll add that I think the quality is great and the etchings are deep enough that regular one-coater polishes will work with them pretty well for stamping. I am not saying it will be perfection, but it will work if you move fast. This plate starts with seven full-nail patterns and eighteen individual images. 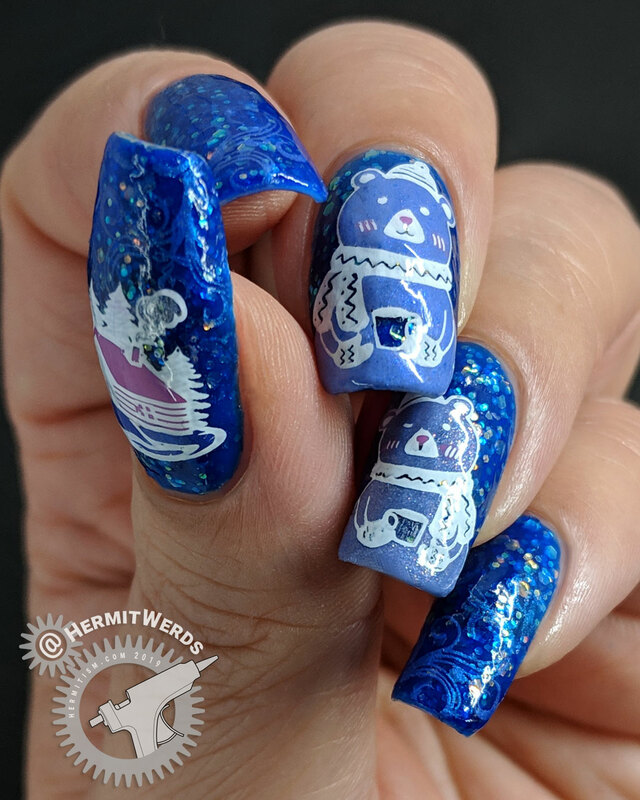 We have some “ugly” Christmas sweater patterns, a few New Year’s images, and one of the full-nail images is full of little pictures that I like to pull out and use individually. For instance that little bag covered with stars could easily be a “magic” bag. I also am in love with that weirdly creepy yet cute “Hoo Hoo Hoo” Santa head. It was very hard for me to not use it as the sample, but I’m going to want a full design of that. Perfect for job interviews and occasions where parents who must entrust their children to you can see them. Okay, maybe it’s just me. I love him though. One annoying thing is that the individual mittens were used again on another stamping plate as a full nail pattern. It’s kind of a waste of an image if you get the whole set, but if you don’t it’s not missing out? I don’t know. I wish they’d just used different patterns on the mittens at least. 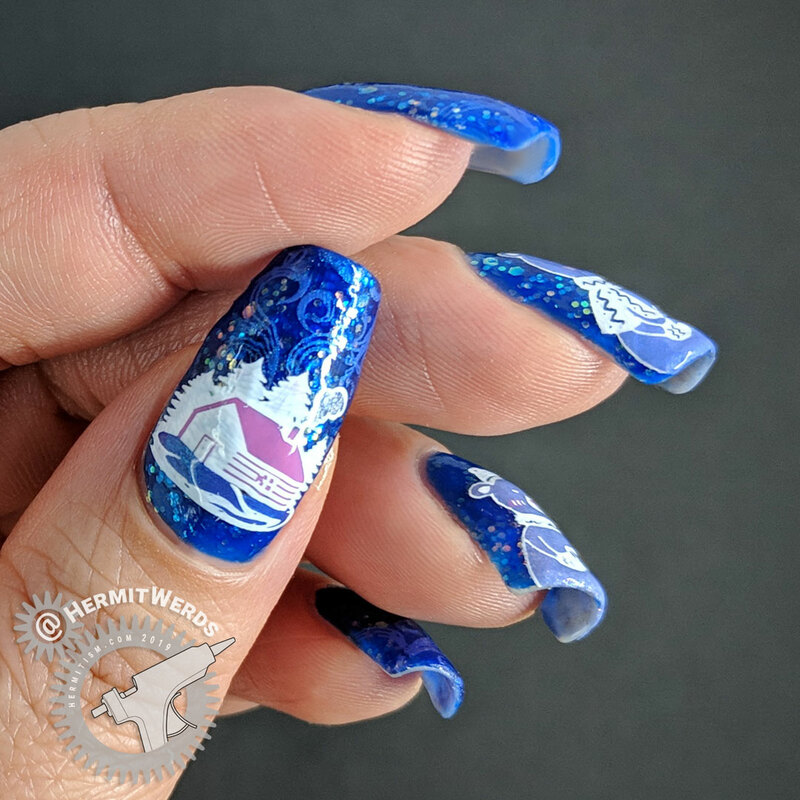 Finally, that full-nail wind pattern is fabulous and can be used allll year round along with the stars. This plate starts with eleven full-nail patterns–three of which are negative space images–and five individual images. Again, we have more “ugly” Christmas sweater prints, but we also have more neutral patterns like the snowflake, argyle, and what I think is supposed to be gingham (very summer friendly). I adore the fireworks image. I am so bummed I couldn’t use it this year. I knew exactly what I was going to paint too. But I’ll use it someday. And all those people cheering, well, I can think of ways that I can abuse them because I’m a terrible person. Fun! While this plate is little bit all over the place style-wise, I think it has some patterns that are veeery neutral and will help tie everything together for lots of combination power! Stockings Stuffed. Background is Cupcake Polish’s “Unbe-leaf-able“. 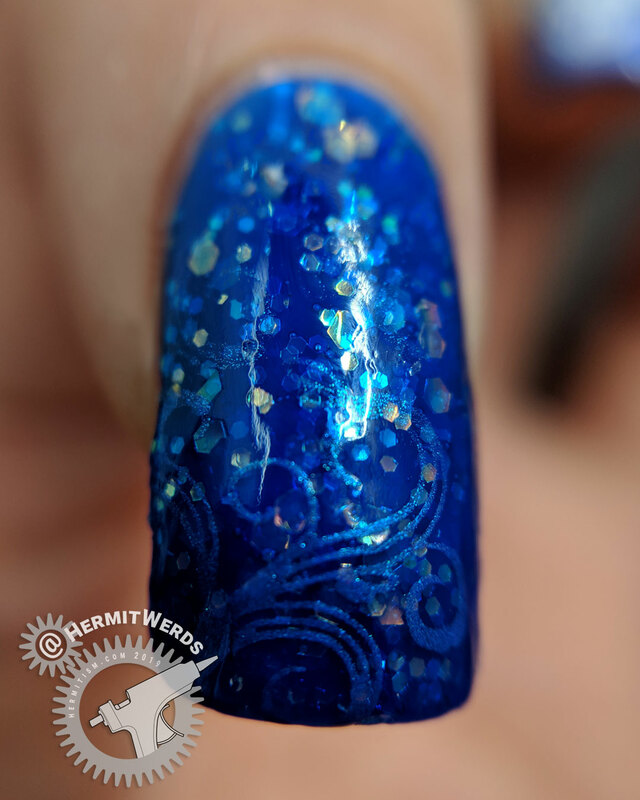 Stamping done with Nails Inc’s Magnetic Polish “Kensington Palace” and filled in with Essie’s “Penny Talk“, Sinful Colors’ “Starfish“, Sinful Colors’ Nail Art “Worn Before“, and Smacker’s “Wickedly Stylish”. Puppy Love Letters. Background is a gradient of Covergirl’s “Espresso” and Butter London’s “East End“. 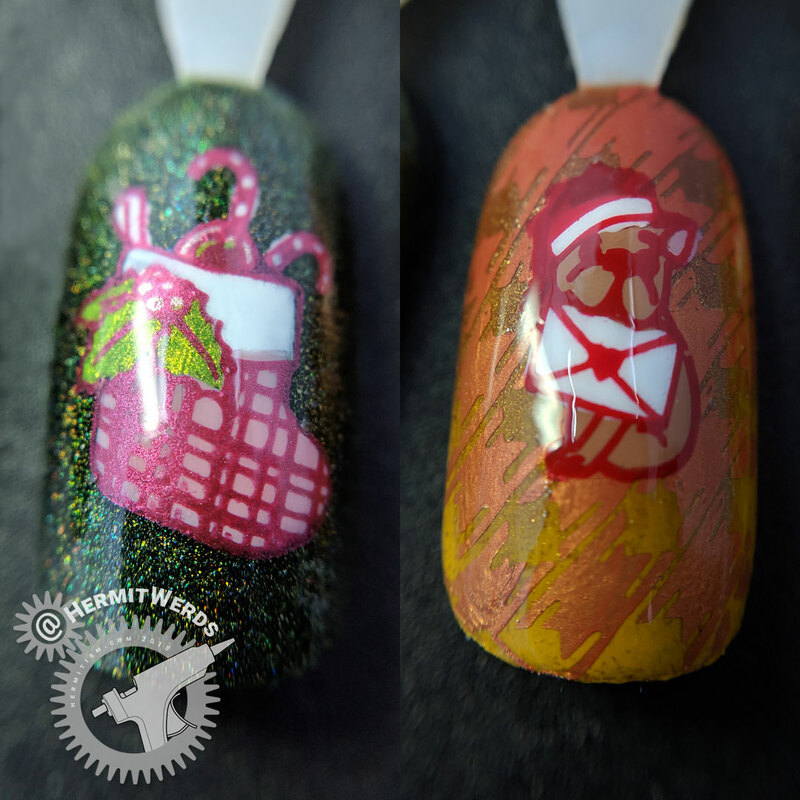 Stamping done with Mundo de Unas’ “Brick“, “Bronze“, and “Red” and filled in with OPIs’ “Going My Way or Norway?”“, Revlon’s “Elegant“, and Smacker’s “Wickedly Stylish”. 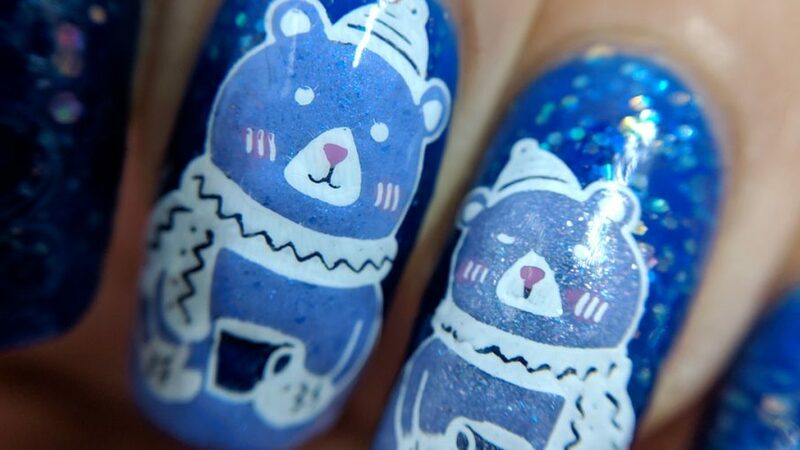 I shrink stamped one of the bears and flipped the other over before filling in the details so it would look like they were individuals leaning towards each other. 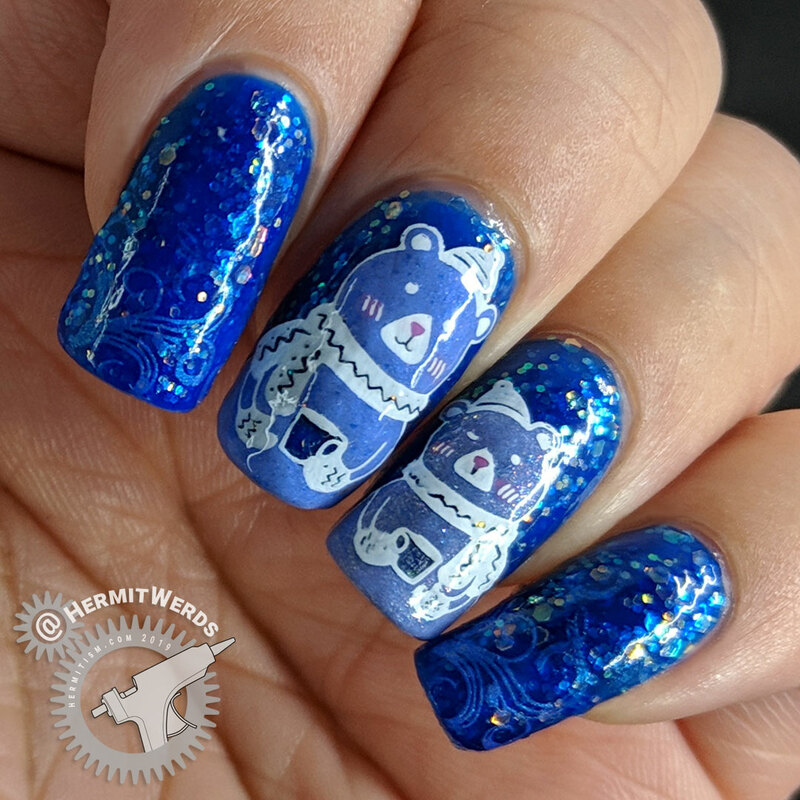 No clone bears for my nails! I chose to make the windy stamped baby boomer french tip nails veeery subtle. The opalescent glitters are pretty attention getting so I was afraid if I made them distinct it would be too busy. So check out the macro if you want to see them more closely. 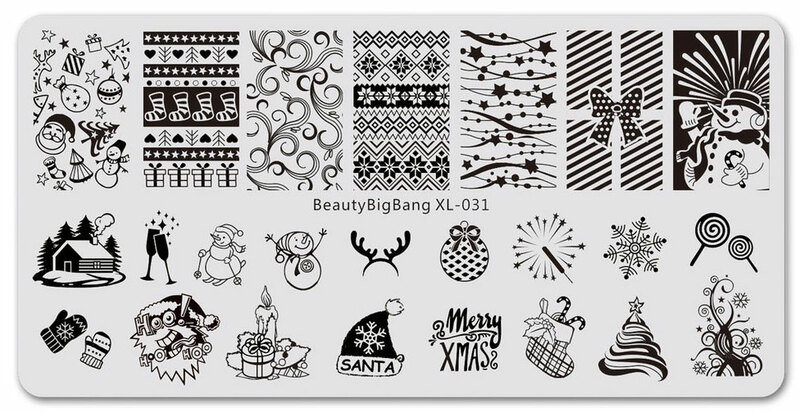 If you’re interested in today’s stamping plates (Beauty BigBang XL-031 or XL-032) or the set of winter stamping plates (ZHSP0467) feel free to use my discount code (hermi) for 10% off your order. (Non-affiliate code). Thanks for taking this nail art journey with me. Until next time, friends!